Get the most out of your workouts and avoid injury with these tips to correct common exercise mistakes. To maximise the benefits of these exercises, aim to perform them in a slow and controlled manner, going through the full range of motion and lifting within your comfort zone. A common error with bicep curls is trying to lift too much weight, which engages the shoulders and reduces the effort on the biceps. If the weight is too heavy, you'll be working the shoulders and not properly targeting your biceps. Your shoulders will hunch forward instead of staying back as you lift the weight, which can cause injury. Leaning backwards when lifting too much weight puts a lot of pressure on the lower back, which can also lead to injury. 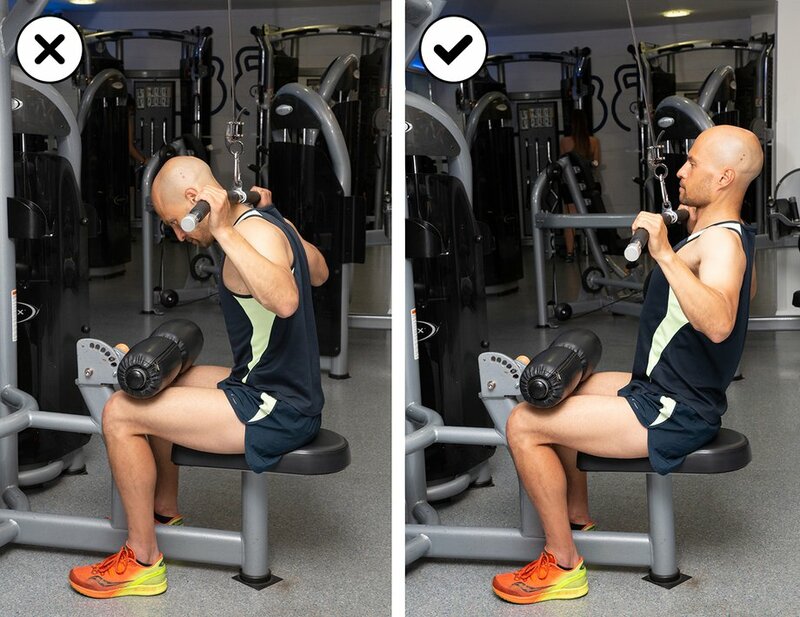 To maximise the efficiency of the bicep curl, lift within your comfort zone, keep your back still and straight, and focus the effort on the biceps only. If you can't do the exercise with the correct technique, it means the weight may be too heavy. The common mistake here is sagging at the hips or raising the bottom too high. Raised buttocks or a collapsing back are a sign of a weak core. A collapsing back also puts too much pressure on your lower back, which can lead to back pain. To get the best results, always maintain perfect form. If you lose form during the exercise, it means your muscles are tiring. Stop and have a rest. You can build up how long you do the plank gradually. 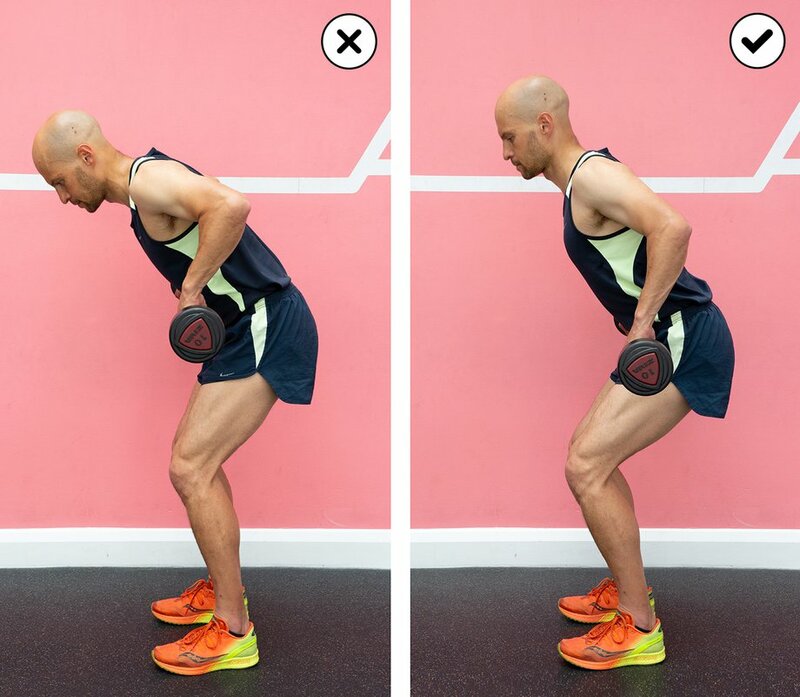 A hunched back is a common error with bent over rows. Having a curved spine when doing this exercise puts a lot of pressure on your back and can cause injury. You should maintain a neutral spine throughout the exercise. To correct this mistake, pull in your core muscles, look ahead of yourself and keep the chest high. Pull the bar up towards the waist, not the chest. Pinch your shoulder blades together as you pull the bar towards your waist. A common mistake with leg lifts is allowing the lower back to arch too much. 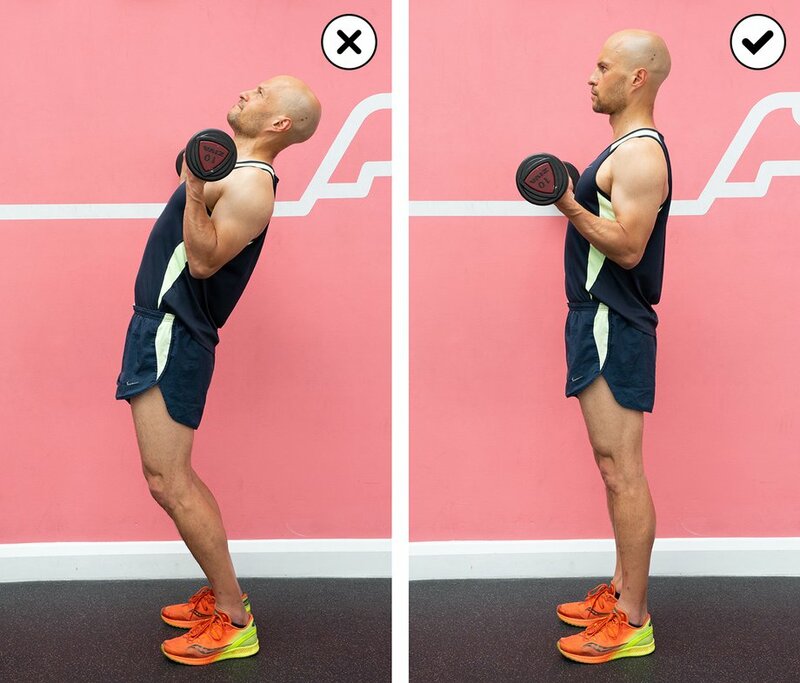 This strains the back and makes the move much less effective as an abdominal exercise. If you don't keep your back muscles and abs contracted, you're only working your hip flexors. If you're just starting out with this exercise, focus on doing a few using the proper technique. You can increase the number of repetitions gradually. To get the most out of this exercise, lower and lift the legs slowly, while keeping the abs under constant contraction and without letting your heels touch the ground. When you feel your lower back starting to arch, it's time to stop. 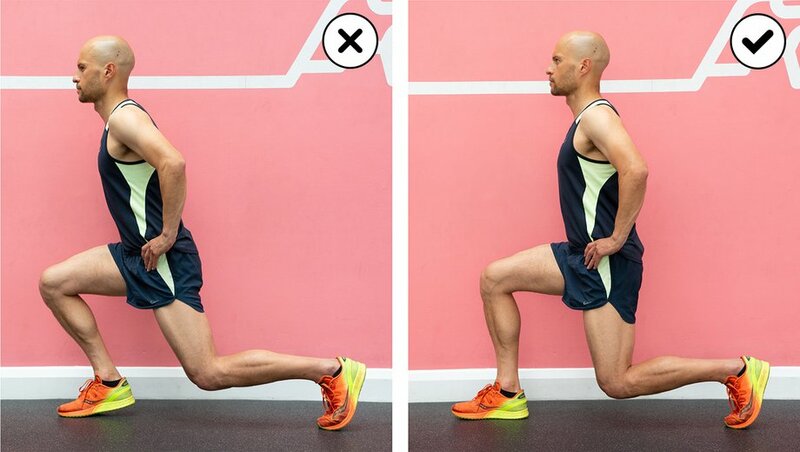 A common error with lunges is stepping into the lunge and allowing the front knee to lean over the toes, which puts a lot of stress on the knee. Using improper form not only has less benefit for the thighs and buttocks, but it can result in injury, especially to the knees and back. All the work should come from the abs, not the neck. If done properly, you shouldn't feel any strain in the neck. 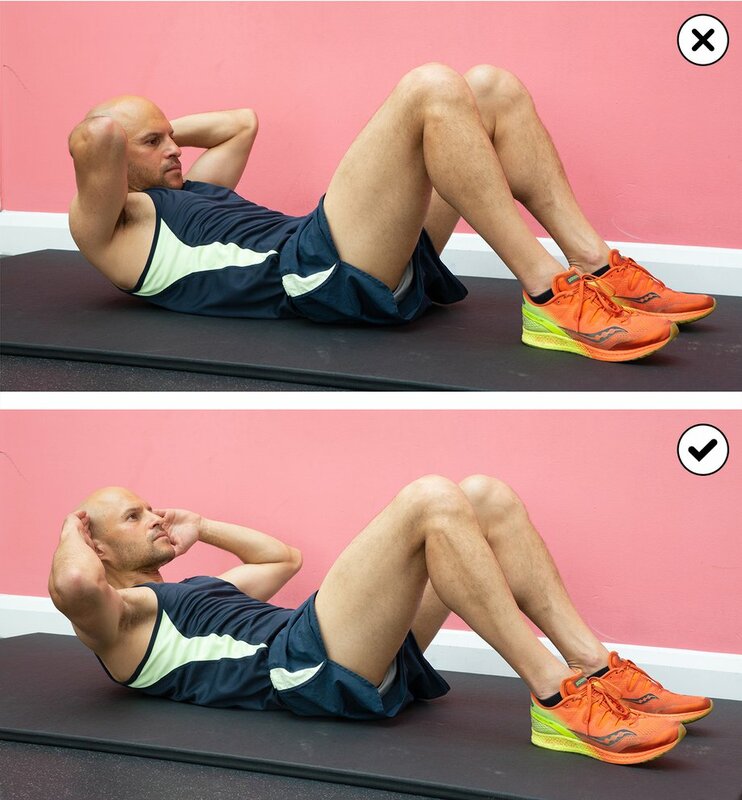 While crunches improve posture, stabilise the core muscles and contribute to a healthy back, doing hundreds of them is probably a waste of time. No matter how many crunches you do, you won't get a 6-pack if your abs are hidden under layers of fat. Curl up until your shoulders are about 3 inches off the floor. 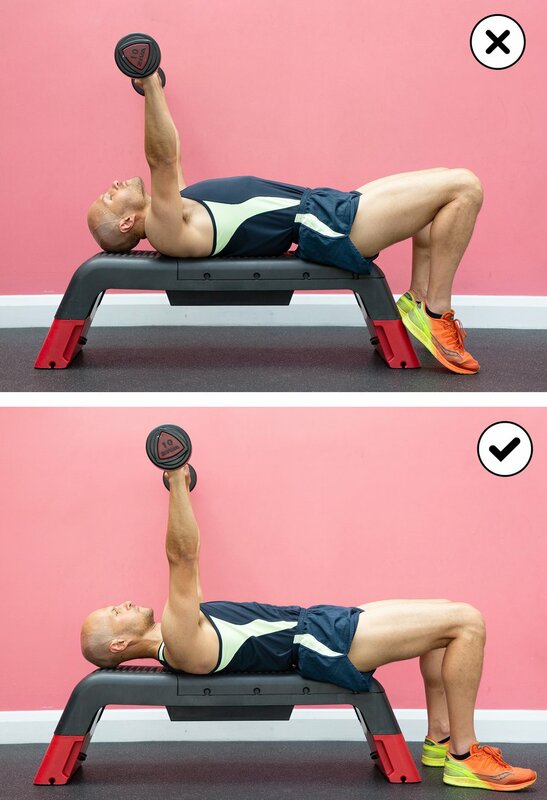 A frequent mistake with the chest press is failing to keep the shoulders back and down. To perform a chest press correctly and reduce your risk of shoulder injury, you should keep your shoulders back and down throughout the entire movement. There's also a tendency to use the legs and buttocks to help with the effort. Don't contort your body in an effort to lift the weight – if you can't maintain proper form, you're lifting too much. Putting too much pressure on the lower back and not enough leg work are common mistakes with the squat lift. Don't round your back. Your spine needs to remain in a neutral position throughout the exercise. All the effort should come from the leg muscles. To keep your back in the correct position, keep your back straight and contract your core muscles and buttocks. As you lower yourself, imagine sitting back on a chair, and don't let your knees lean over your toes. 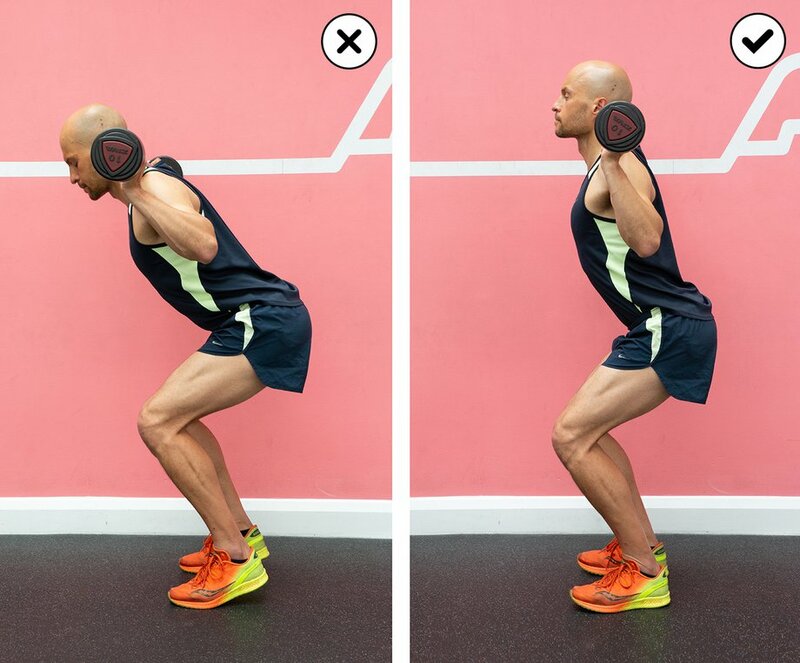 Practise the correct technique using a weightlifting bar or squat rack without weights in front of a mirror. When you come to using weights, it's advisable to have someone experienced watch you. A common issue with lat pulldowns is pulling the bar down behind the neck. When people perform the lat pulldown behind the neck, they tend to bend their head forward as they bring down the bar, which puts strain on the neck and shoulders. It's safer to bring the bar down in front of your body. Keep your spine in a neutral position and engage your core muscles throughout the exercise to protect your back. If you find you're arching your back as you pull down, it probably means you're lifting too much. Starting with your knees bent right into your chest is a common mistake with the leg press. This starting position is often referred to as "going too deep" and puts a lot of pressure on your lower back. In the starting position, your legs shouldn't be bent more than 90 degrees. When you straighten the legs, push through the heels and not the toes to avoid straining the knees. Don't lock your knees when you straighten the legs. As you straighten your legs, maintain a neutral spine and keep your neck relaxed. Maintain a neutral spine: don't flatten your lower back against your support.